36 HEAD COUNSELOR (to 3rd Reader) "I see no reason to deny." (to 2nd Reader) "Impartial One...let him read directly from the Book of Life..." MR. LINCOLN (in grand Lincoln-esque style) "Here's one...a resolution I presented...it is dated September 12th, 1849...it will show that I've always universally desired the freedom of all people, anywhere. This concerns the Hungarian Revolution of that year." Resolved, that in their present glorious struggle for freedom, the Hungarians command our highest admiration and have our warmest sympathy. Resolved, that they have our most ardent prayers for their speedy triumph and final success. Resolved, that the Government of the United States should acknowledge the independence of Hungary as a nation of free men. 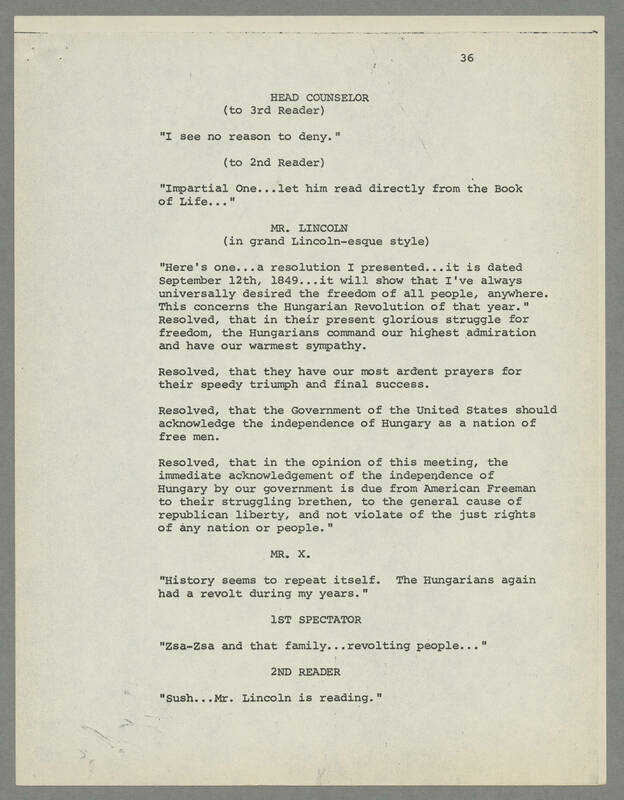 Resolved, that in the opinion of this meeting, the immediate acknowledgement of the independence of Hungary by our government is due from American Freeman to their struggling brethen, to the general cause of republican liberty, and not violate of the just rights of any nation or people." MR. X. "History seems to repeat itself. The Hungarians again had a revolt during my years." 1ST SPECTATOR "Zsa-Zsa and that family...revolting people..." 2ND READER "Sush...Mr. Lincoln is reading."